The Donald Trump is somebody any cartoonist must familiar how to draw behind all, He is the next President of the US. Now, you will find Donald Trump Drawing Mask in many of his rallies and gatherings. So, here are the steps to draw Donald Trump Drawing. If you wish to draw Donald Trump drawing and also not having enough idea and guides to draw then don’t worry. No matter, whether you are well versed in drawing or else not even have a single idea about drawing. 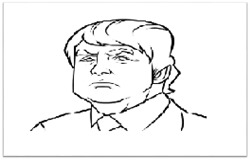 By using the upcoming guides you will able to draw an outstanding Donald Trump drawing by your own with a guide of step by steps instructions. Here is the step by step instructions which are you looking to help you to draw Trump drawing in an efficient way. Go through the following steps and starting drawing by your own practice to obtain proper Donald Trump picture. You need to learn the below following instructions to draw Donald Trump. Now, let us begin along with guides for head due to a head is one of the major parts of the human and when you start with the head then you will able to complete the image in the best manner. Just draw the facial guides with the shoulder as similar the below-given image. By using this instruction you simply create, define the shape face structure of Donald Trump as it is given on the image and then start to sketch in few of the hairstyle. Simply sketch out what you are observing on the below-given image of Donald Trump. In this next step, you have to sketch out in the thick, and an expressive eyebrow which is given in the following image. After performing this, then draw few the noises which is close to the eyebrows. Next, sketch the proper shape of Donald Trump and then sketch in those high expressive eyes with this popular mouth. Just make sure to sketch in the bottomless indent below the bottom lip as well as little frown lines in the direction of a nose as well as ends of the eyes. At last, here you will find out the complete drawing of Donald by drawing his exact hairstyles. In addition, it must be combed on the back style and simply sketch out the shape of his ear, neck and then shirt collar, tie as well as a suit jacket. After drawing all those things, then include the seam lines and also erase the fault and guides. This is the last step and after completing this step you will get a line art while you are done everything. Now, the major and important thing that you have to perform is just picked out the colors you like or else as given on the below image than color Donald Trump, and then you will be admired how you have done is Donald trump drawing procedure. Hence, these are the 6 easy steps by steps instructions aid you to draw Donald Trump drawing. The only things you need to do is just read all above given 6 stepwise and do as it is. Just have a note and pencil on the side and go through the steps and practice it. Similarity, do the remaining steps without ignoring any steps. After doing all those things, then you will finally get a Donald Trump drawing.